The information on this page has been supplied by the Old Hastings Preservation Society. Neither the Hastings Old Town Carnival Association nor the webmaster accept any responsibility fot its accuracy or otherwise. PRS for Music licences the use of copyright music across the UK, giving businesses and organisations the legal permission they need to play the music they want. These licences ensure that music publishers, songwriters and composers are fairly rewarded with royalties so they can keep making music - and mean that we’re able to support music at events like this. On the Stage, Reeves Corner, High Street The Annual Old Town Criers Competition. Come and watch or have a go yourself and try to beat the reigning champion. Men & Ladies competition. Prizes of Case of Wine for both Lady and Gentleman winners. Register at Reeves Corner at 7.00 for 7.30pm start. A High Street Traders Event. Neil Simon’s play ‘London Suite’. Tickets from the Box Office open Monday to Saturday 10.30 to 1pm. Coastguard Sector Base. Rock-a-Nore [next to the car park] Cakes and refreshments available. at Swan Avenue TN34 3HX. Bargains Galore. Entry free – Donation to OHPS welcome. In memory of Mary Allaway. [110 The Bourne] Entrance between 139 and 140 All Saints Street Coffee, cake and biscuits and five hidden gardens Donation to OHPS. St Clements Church, High Street Admission Free – A selection of local arts and crafts are on sale in this magnificent medieval church, with refreshments served throughout the day and light lunches. Profits go to the Two Towers Trust, the charity which helps raise funds to maintain the fabric of the Old Town’s two ancient churches. This years theme ‘On the Street where you live’. A team of judges will select winners in categories depending on the size of the window. Certificates will be presented at 1.00pm on Sunday 30th by Carnival Queen Elizabeth Fowler on the stage at Reeves Corner. Stade Open Space on the Beach Concert Stage. and Fishermen’s Museum Exhibition. At the Flagstaff outside Hastings Fishermen’s Museum. Rock-a-Nore. The union flag will be raised and Hastings Old Town Carnival Week declared “Open”. A VIP will the open the ‘Today’s Fishermen of The Stade, Hastings’ a photographic exhibition by Ann Chown. Entrance free donations welcome. Wheelchair accessible. On the Stade Open Space. Gates open at 1.30. Bands from 2pm. Rhythm Fields, The Rocking Ambassadors, Dead Calm, Local Heroes and The Blues Brothers Show. NEW THIS YEAR At 3.30pm we will be asking everyone who has come wearing Beach Concert t-shirts “Through the ages” to gather and parade around the site – Lets see how many years we can cover, with a prize for the oldest shirt there! Collections in aid of Hastings RNLI, Pett Level Rescue and Hastings Sea Cadets will be taking place on site and around town. This is a free event so please give generously. We have limited seating so why not bring a deckchair or rug and get comfy for the afternoon. Licensed Bar, Catering and more on site (all profits from these go to the charity collection). No dogs allowed (sorry) and no glass or alcohol can be brought onto The Stade. With many thanks to all our generous sponsors who are supporting us again this year. Another High Street Traders Event. Old Hastings House, TN34 3ET A variety of stalls inside and out. Children’s Entertainer. On the Stade Open Space This year we want to see how many T-shirts designs from the last 28 years of the Beach Concert we can find. Come on down to The Stade wearing your “oldest” commemorative T-shirt. There must be all of the years out there somewhere. So please take part and see just how many years we can cover. There will be a parade and a prize for the “oldest” T-shirt. High Street. The congregation welcome you to Mass. In memory of Mary Allaway [110 The Bourne]. Entrance between 139 and 140 All Saints Street Coffee, cake and biscuits and 5 hidden gardens Donation to OHPS. Rock-a-Nore Road The Hastings net shops now Grade II* listed because of their architectural uniqueness. Since the 1980s, local historian Steve Peak has played a leading role in saving them, and he owns one, dating from 1835, which he preserves as a museum. Inside is a large collection of original fishing and marine artefacts, many dating from pre-World War Two. The museum is not open very often, but today you can come inside and catch a glimpse of life in the days of sail (but not if it is raining!). Admission free (donations to OHPS). There will be showings all day of the amazing films of Glen Veness – “I Love this Town” along with the music and film of The Ghost of Dunkirk and footage of previous Beach Concerts. Collections at the door for both funds. Lower Torfield Allotments, bottom of Old London Road. With Scarecrow contest and Willow weaving for children, entry by donation. Not suitable for wheelchairs. Donation to OHPS. Winkle Island.The ancient game of Winkle Tossing, see how successful you are at tossing winkles into various sized containers. Entry fees £1 adults and 50p under 13s. Prizes and certificates for overall Junior and Adult winners. Raising funds for Winkle Club Charities. ourthouse Street Have a real bumper Cheese and Wine lunch, including a plate of mixed French cheeses with French bread sourced from Judges, your local baker. To tempt your Continental palate it will be washed down with a complimentary choice of red, rose or white wine or a bottle of water. All this for £4.75 a head. For the connoisseur, have a glass of port with stilton which has been donated by The Jenny Lind and Penbuckles in the High Street – for another £4. Come and join your hosts, Peter and Jo. Another High Street Traders event raising funds for local Charities and Good Causes. meet at Hastings History House. Register at Winkle Island by 6.30pm finish at the Lord Nelson Fancy dress a must! Teams race round the Old Town with collecting boxes to find answers to questions, which are all in pubs, of course. 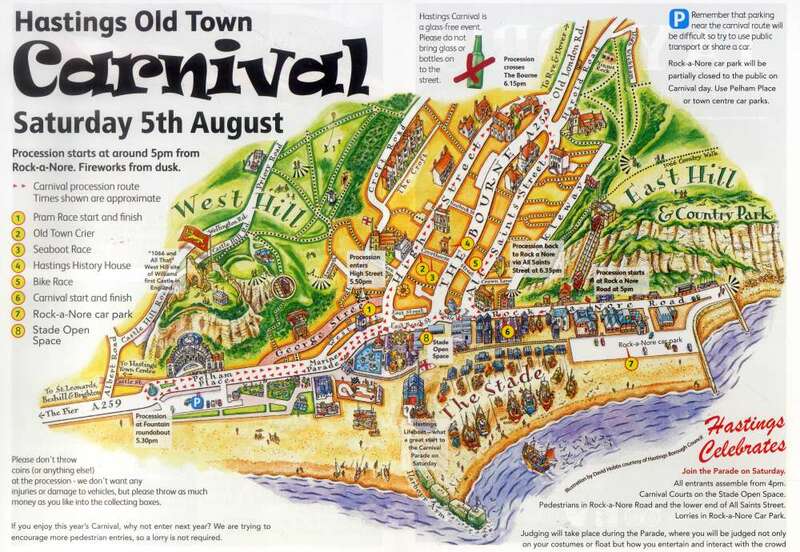 Why not take part in a tradition of Old Town Carnival Week – all great fun! Prizes for all! Raising funds for MacMillan Cancer Support. All Saints Church, All Saints Street TN34 3BP Matthew Jorysz from Westminster Abbey will play an exciting concert on the 1878 Father Willis organ. Including works by Mozart, Bach, Alayn, Duruflé, Franck and Elgar. (Assisted wheelchair access from Tackleway via side door). Tickets: £10 at the door. In aid of All Saints Organ Fund. Starts at Butler’s Gap, George Street. TN34 3EE. Spooky things are happening in Hastings Old Town! The dead are rising from their graves and walking the streets of Hastings once more and they have many stories to tell. Family friendly and arrangements can be made for disabled access [Please email hastingsghostwalks@gmail.com if you need assistance]. Walk ends at the Stade opposite the Dolphin. Tickets £5 for adults and £2.50 for children under 12. Garden Cottage, Croft Road TN34 3HJ Visit this small entrancing courtyard garden. Cold drinks available. Courtesy of Ann Novotny. Entrance fee £2. In aid of Crohns and Colitis UK, donation to OHPS. All Saints Church Climb the spiral staircase to the ringing chamber, see the bells and have a go at chiming one. See also the, as yet unexplained, carving on one of the stones in the ringing chamber. There will be a charge towards the tower fund. The Stade A chance to have a look on the Lifeboats and meet some of the crew, subject to operations. Donations to Hastings RNLI. All Saints Church Hall, All Saints Street organised by 2nd Hastings Rainbows. Hot and cold buffet lunch with a choice of either meat, cheese or quiche, one visit to the extensive salad bar featuring a selection of about 15 different home-made dishes, and a choice of a roll/bread or potatoes, including tea/coffee or a soft drink £5. Desserts are also available. Wheelchair accessible. Raising money for Dragonflies – a children’s bereavement charity. Donation to OHPS. Old Hastings Preservation Society Meet at 2.30pm at the top station of West Hill Lift. Meet at the Shipwreck Museum, Rock-a-Nore Road. On the Stage, Reeves Corner, High Street Hastings Old Town Carnival Queen Elizabeth Fowler is presented with her Portrait by Juliette Dodd, the well known portrait artist. Illustrated Talk. Some Old Town Curiosities with Michael Plumbe. Hastings History House, 21 CourthouseStreet. not advisable to bring dogs to this event and young children should be under the supervision of adults. Please give generously to the “bucket rattlers” collecting for local charities and good causes. All Saints Church All creatures great and small warmly welcomed. Come and celebrate the joy and love of our pets. Please make sure they are under control and well behaved. Starts at Butler’s Gap, George Street, TN34 3EE Spooky things are happening in Hastings Old Town. The Bourne The theatre building dates back to 1746 and has been a theatre since 1959 - come and hear how it all began. Tour includes backstage (where possible). Donations to OHPS. Enquiries Box Office 01424 423221. Old Town Brewery, Torfield Cottage, 8 Old London Road. Tours will take place half-hourly from 11 am. We invite you to come and sample the real ales and have a look at the brewery, re-located from the First In Last Out pub in the High Street. Donations for the Seaview charity. Hastings History House, 21 Courthouse Street. Come and enjoy a coffee and browse in some of our archive material. Who lived in my house? Why not check in our collection of street directories and images and view some films of our lost heritage. 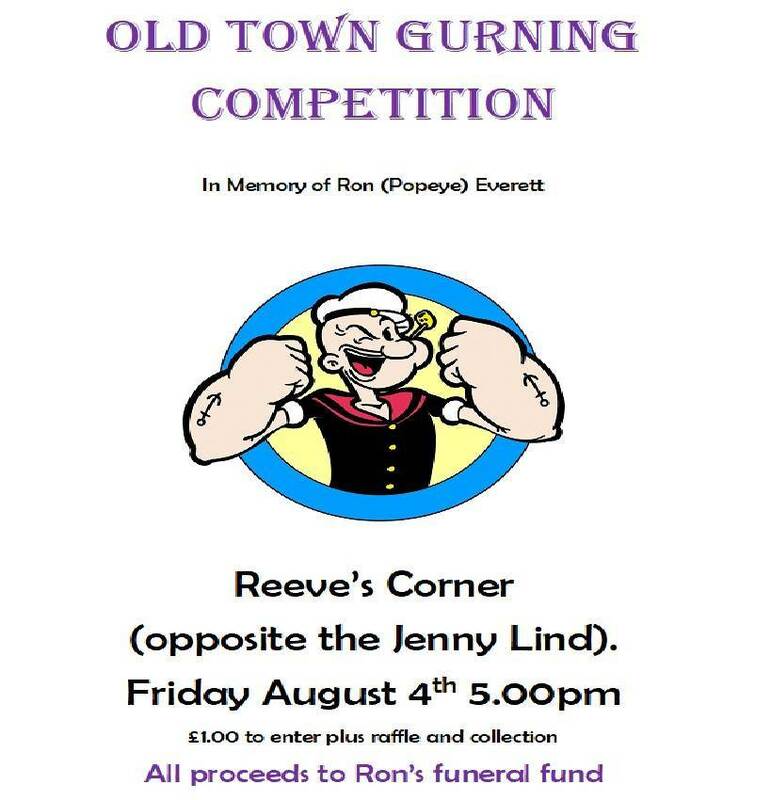 charity which helps raise funds to maintain the fabric of the Old Town’s two ancient churches. Meet at the lower East Hill Lift station. Adventure Golf, Marine Parade. Tee off at 6pm. Concessionary fees, open to all with trophies for winning Lady / Gent and Junior. Money raised to Hastings Winkle Club for local good causes. Register at The Cutter Pub, on the seafront opposite the boating lake, by 6pm on Tuesday 1st August. Get your team together for a great night (with decorated pram, of course!) that’s often described as one of the best in Old Town Week! Lots of money is raised for local charities by the teams who enter in this pub crawl. Each team has their own theme and they decorate their pram and teams accordingly. Due to the ever increasing size of this event, all teams must now be entered by 6pm on Tuesday 1st August at The Cutter Pub. To be considered for judging, teams must arrive by 7pm, with the start time of the race to be between 7.30-8pm. This is a strictly over 18s event. Any questions please call 01424-272099. Proceeds to H.O.T.Carnival Association. The Bourne The theatre building dates back to 1746 and has been a theatre since 1959 – come and hear how it all began. Tour includes backstage (where possible). Donations to OHPS. Enquiries Box Office 01424 423221. On the Stage, Reeves Corner, High Street Come along and view all the items donated by local traders, residents and friends. All to be sold with No Reserve so you are bound to pick up a few bargains. Auction this evening starts at 6.30pm. A High Street Traders Event. 106 High Street, (entrance from Salters Lane). A delicious cream tea in the beautiful walled garden of the historic former Old Town Rectory. Courtesy of Craig and Jo Sams. Entrance price £5 includes scone, jam, cream, unlimited tea and coffee (extra scones 50p). £2.50 for children (scone, jam, cream and unlimited squash). A grand fundraising beauty raffle will also be held with fabulous prizes. All proceeds to Friary Gardeners with a donation to OHPS. member of the Hastings Lifeboat Crew - to be held for one year. Will Danny do it again? Sponsored by White Seafood & Steak Bar. Another High Street Traders event. Butler’s Gap, George Street. Please join the Class Choir for a performance of vibrant and musical singing of contemporary popular music. All Welcome. Donation to OHPS. dress affect your health. Free event – donation to OHPS. Butler’s Gap, George Street. Please join Soundwaves Community Choir led by Debbie Warren for approx. 30 minutes of joyous music. Donations to local charities and OHPS. On the Stage, Reeves Corner, High Street Grand Auction of gifts donated by local traders, residents and friends. All sold with no reserves, so you are sure of a bargain. Auctioneers: Ian Porter & Deeday. Raising funds for local good causes. Thank you to the generous people who donated the lots. Another High Street Traders event. Starting at Winkle Island Mad Jacks Morris will be performing at various locations around the Old Town. Donation to OHPS. All Saints Hall, top of All Saints Street Selling home baked bread, cakes and savouries; also eggs, plants, flowers and craft items. Free entry. Donation to OHPS. Meet at the Fishermen’s Museum. Walk free donations welcome. Hastings History House, 21 Courthouse Street. Local cheeses from Penbuckles and fine wines. Great value at £6. Organised by the Old Hastings Preservation Society. Join us for a convivial lunch. 9 All Saints Crescent New for 2017 – this hidden gem of a garden, nestling under the East Hill courtesy of Sarah and Tim Walsh. Entry £1 in aid of Hastings Lifeboat and donation to OHPS. Refreshments available for a donation. The garden has steps so regret not suitable for wheelchairs, it also has an open pond. Strawberry Cottage, 36 Tackleway. Visit this beautiful secluded garden courtesy of Don Brant. Entry £1 and enjoy a glass of Buck’s Fizz for £1 donation to OHPS. Regret not accessible for wheelchairs as 3 steps down into the garden. Courthouse Street Back by popular demand – The Bangers & Mash Blowout! – only £5.50 from your host Deeday. A Street Party with a difference. Compliments of Peter and Jo. Have succulent local homemade Pork Sausages with creamy mashed potato, baked beans and rich onion gravy and a complimentary bottle of French Beer or water. Only 150 seats available, so it’s best to book in advance. Tickets from The History House or The Cobblers in the High Street or Deeday’s yard in Courthouse Street. Donations to Local Charities. Another High Street Traders event. On the Stage, Reeves Corner, High Street. Presentation of cheque to the Hastings Lifeboat Crew for £1,066 by High Street Traders. Meet at the Shipwreck Museum, Rock a Nore. All Saints Church Hall, All Saints Street, TN34 3BP Admission £2.50per person, teams up to a maximum of six. The Two Towers Trust and Hastings & Rother Family History Society are jointly organising the grand quiz. There will be prizes for the winning and losing teams, raffle prizes and a door prize. Refreshments available or bring your own! Profits go to the Two Towers Trust, the charity which helps raise funds to maintain the fabric of the Old Town’s two ancient churches and the Hastings and Rother Family History Society. The Bourne ‘Emma’ a new stage adaptation of Jane Austen’s classic. Tickets from Box Office open Monday to Saturday 10.30 to 1pm Phone 01424 423221.
past and present; look at the photo album. Donations to Prostate Cancer UK. Meet at the Shipwreck Museum, Rock-a-Nore Rd. Isobel Blackman Centre, Winding Street. In aid of Hastings Lifeboats. See map for route and more information. The congregation welcome you to Mass in the beautiful St Mary Star of the Sea Church. All welcome to join in this popular celebration on the Stade Open Space. (also open on Saturday 5th) 135 All Saints Street –the house and the former Old Town Mortuary See Saturday 5th for details of this not to be missed opportunity to see a Tudor house sensitively restored. It is like stepping into the pages of a Grimm’s Fairytale. Come and see – you’ll be amazed. At The Beacon. 67-68 St Mary’s Terrace TN34 3LS [Down the steps from No 12.] You are welcome to join us for this celebration; free entry to the Beacon. Enter the Beacon cake competition, the entry fee of which we will be donating to OHPS. Live music, vintage clothes, Summmer cocktails, Beacon’s Ploughmans and creatm teas; the bar is open. Unfortunately the garden is not fully wheelchair accessible, but there is a ramp from the car park into the garden area and we are willing to help. www.beaconhastings.com or 01424 431305. Meet at Shipwreck Museum, Rock a Nore. Hastings History House An illustrated talk by Ken Brooks, tickets £4 refreshments included. On the Stade Open Space You are invited to join in singing “Songs of Praise”. 60 Old London Road. Open Garden courtesy of Gwen and Michael Blandy. Two acres of winding paths leading to a wooded area ascending the West Hill with views to the East Hill. Lawned area with herbaceous border and pond, containing koi carp and golden orfe. This is a garden still being developed. Entrance £1.50 children free. Pimms £1.50 or juice £1 donation. Some garden seats available. Not accessible for wheelchairs. Donations to OHPS.